Welcome to daptics, the new name for ProtoLife.com. Your existing ProtoLife.com login and sessions are still valid. Please bookmark https://daptics.ai for future use. With daptics, huge experimental campaigns become feasible, even if you are on a budget. Increase high-throughput productivity by orders of magnitude, driving a proportional increase in ROI for your lab. 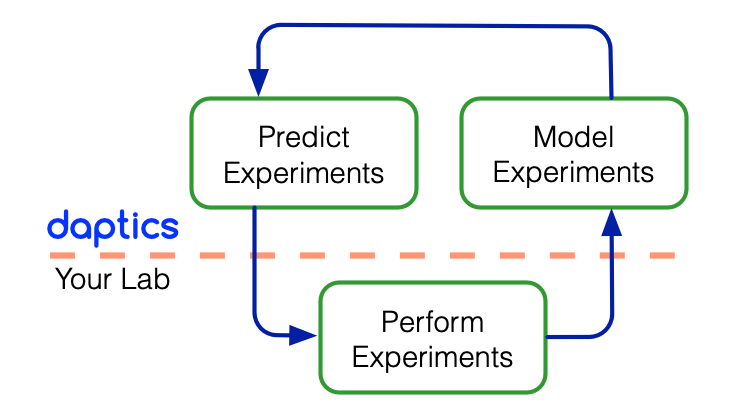 daptics uses state-of-the-art machine learning techniques to close the experimental loop by building predictive models from your experimental data, and delivering new experiments that are most likely to give improved results. Years of development and experience in the use of data science for design of experiments are now available through daptics' easy-to-use web interface. You don't need to be a data science expert, and you don't need to hire one.